It's so interesting how I find myself in food ruts. There are very few things I don't like, yet I gravitate towards the same things. 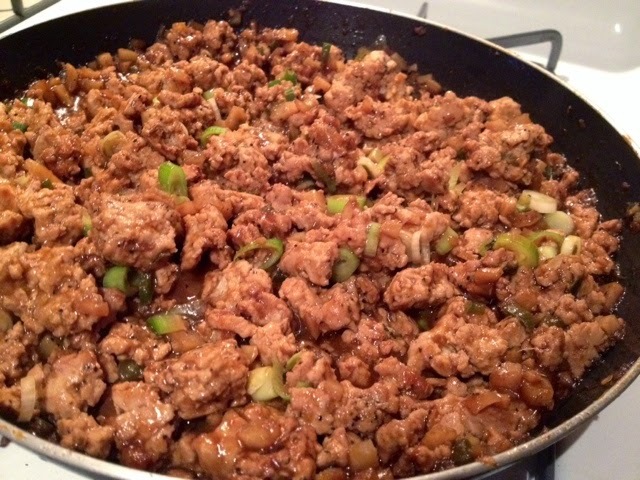 For instance, I often cook chicken, steak, ground turkey/chicken but rarely cook pork, lamb, seafood, etc. 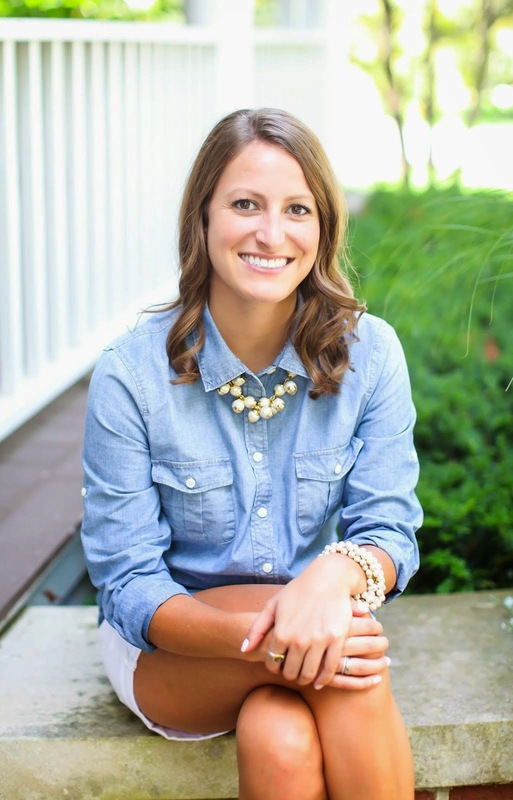 I don't know if it's about stepping out of my comfort zone and being intimated or just sticking to my trusty standbys while shopping for the week. Does anyone else experience this? 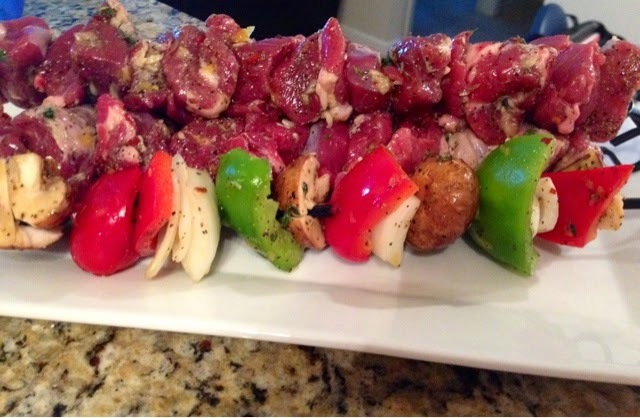 Since as long as I can remember my boyfriend has been requesting lamb kabobs... A simple request that has taken me over a year to make. I grew up having lamb once a year, on Easter Sunday, which was prepared by my Nana. It was always delicious and left me looking forward to it the next year but I never thought to cook it myself or any other time besides Easter. Well, I did the unthinkable and made it last night and have to tell you, I don't know what I've been waiting for. It couldn't be simpler and a great switch up to my usual Sunday dinners! I bought a boneless leg of lamb and cut about half of it into 1 1/2-2 inch cubes. I saved the other half for roasting this week. There was a great deal of fat and silver skin on mine, so I had to trim it up quite a bit but you could always have your butcher do that for you. You'll want to make sure the lamb and veggies are well seasoned so I marinated both for about an hour prior to cooking. I took 2 large Ziploc bags and to each added about 3 Tbl of olive oil, 1 Tbl lemon zest, 2 minced garlic cloves, salt, pepper, red pepper flakes, and 1tsp fresh thyme. In one bag put your cubed lamb and in the other, large cubes of whatever veggie you like. I used onions, bell peppers, and mushrooms. I love kabobs but always hate when meat isn't cooked all the way through while the veggies are burnt to a crisp, my resolution? Skewer them separately! This way, you can control cooking times. 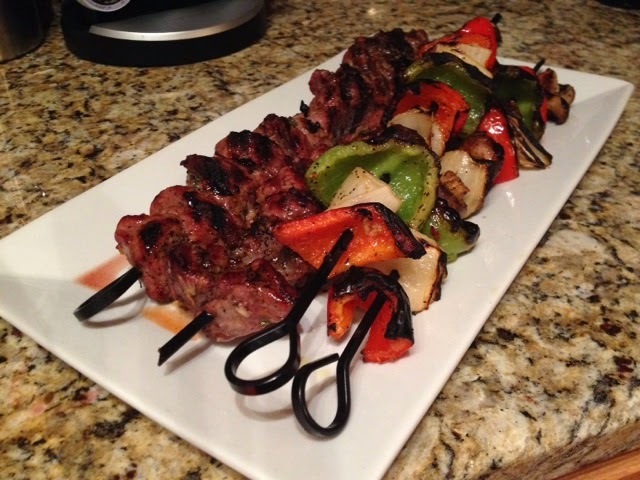 Once the skewers are grilled to your liking, lamb should be served about medium rare, remove the meat and veggies to a platter so everyone can help themselves. 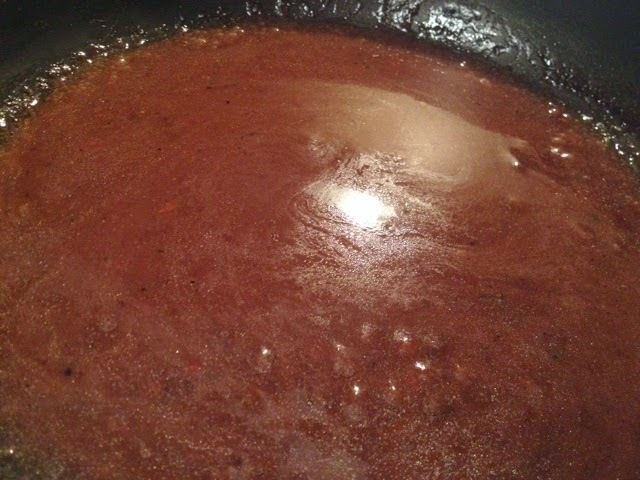 To serve alongside for dipping I made a little wine sauce, that literally took about 8 minutes. I heated 1 Tbl olive oil to a pan and whisked in 1 Tbl flour. Once the flour was well combined I poured in about a cup and a half of beef broth and 1/2 cup (or so) of wine. 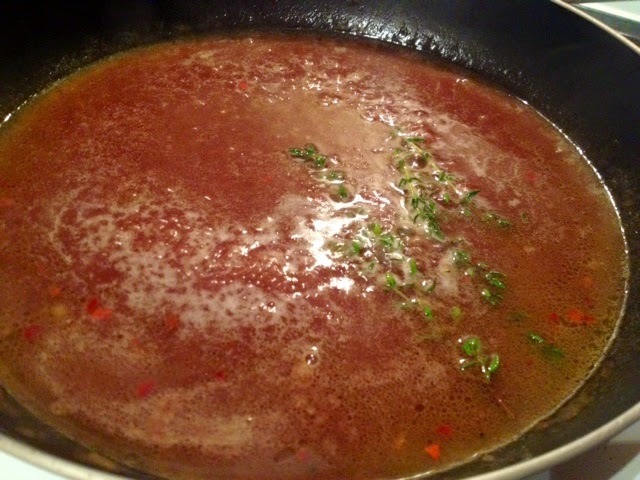 I added in a sprig of thyme, salt, red pepper flakes, and pepper and simmered on medium heat until it thickens and reduces a bit. This was quick and luxurious! Please excuse my dark photo, I was eager to devour this. Try something new this week and step outside of your normal go-to meals...this could be a new standby! If you just started following my blog, welcome! If you've been around for a few posts, thanks for coming back! 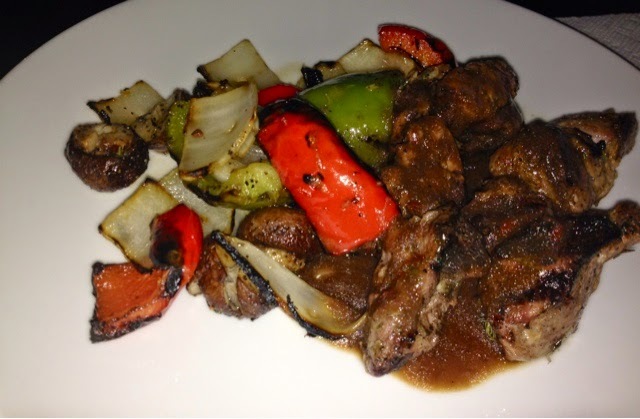 By now you can get a rough idea about my style of cooking and flavors I gravitate towards. 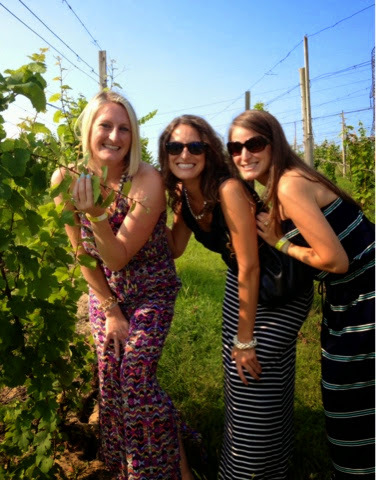 But some of you may wonder who I am, why I blog, why I drink so much wine, and why should you join me in this journey? I am happy to give you a little insight into some of these questions! I am a stereotypical twenty something girl, love the color pink, dressing up, shopping, and traveling. I am years ahead of my time, always have been. I'm an "old soul" as family members say, which I haven't decided is a good thing or not! I am definitely a homebody, I don't love the bar scene or staying out late drinking. I do enjoy staying home with my boyfriend or close friends to drink wine, eat delicious food and play games. I am very family orientated and feel strongly that I have been blessed with the best family in the world. I am the youngest of 4 girls and am 6 years apart from my oldest sister, which means we are all very close in age and have a lot in common! They are my best friends and role models and always make me smile. Sister nights are something I look forward to and always grew up thinking how cool it will be when we're old and married with kids...can't believe we're already there...well, almost! My mom is my rock and is the first person I call to share great news, vent to, laugh with, or shoulder to cry on. My dad is a saint! Everyone asks how he does it, having so many girls in his life and the answer always is vodka. He loves his martinis and has gotten us girls into martinis too, extra dirty with blue cheese olives, to be specific! He is the most patient man I know and has dealt with so much with us girls that I still don't know how he does it. I got started blogging after years of envying other blogs. After countless hours a week following everyone else's lives, my boyfriend Sean asked me why I don't just start my own. Truthfully, I don't think I live as exciting of a life as others. He reassured me that I can do anything I set my mind to and if I wanted something, to go for it! I dipped my toes in, not knowing what to expect and I still haven't figured out the answers. I enjoy it, I feel serenity in writing, and hope that I can share a recipe someone will try and love. 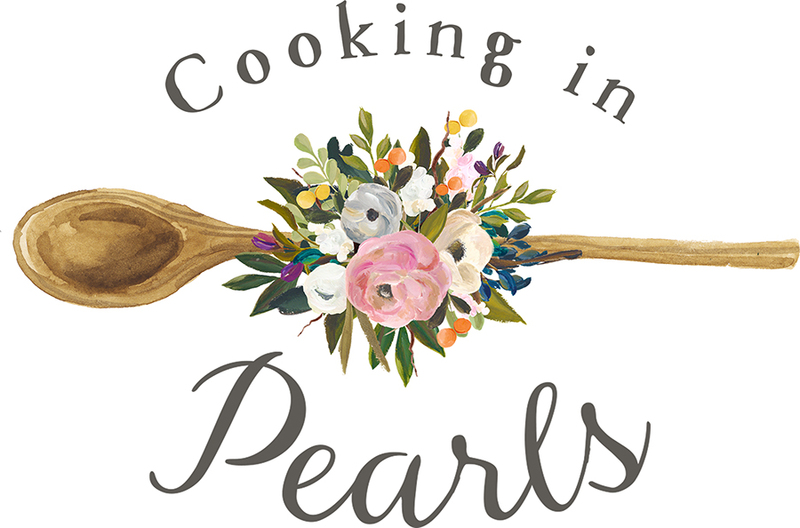 Blogging is a safe zone for me, cooking whatever I feel like, sharing what's on my mind, and spreading my passion for all things food with anyone who visits my site. As I've said, I am a big wino! I grew up in a house where my parents celebrated happy hour at home often, with a glass of wine to catch up on each other's day. As my sisters and I got older we too partook in this time of day and my wine palette has since evolved and improved tremendously! 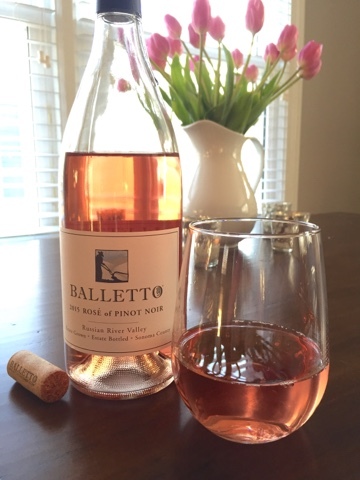 I love learning about wine, trying different blends, and picking out new bottles wherever I go. I do not drink every night, although I wish a glass a day kept the doctor away...that's something I should look into! I also want to be clear that this blog is a two-way street. If there's something you want to learn how to make, have a "dumb" culinary question, need me to debunk a knife skill/technique you aren't sure about please let me know! I'm happy to be a resource of what I know or learn something for you that I'm not sure about. You can reach out to me in my email tab or find me on social media. 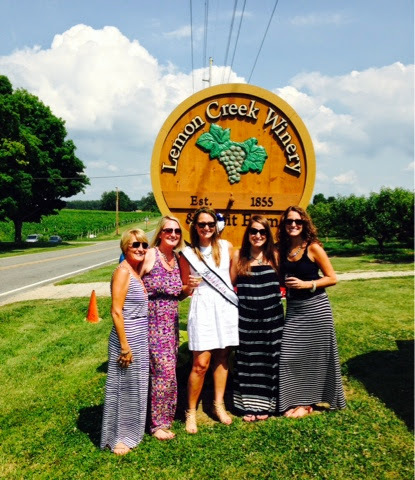 Here's a couple pictures with my mom and sisters from this past weekend, celebrating my sister Emily's bachelorette party in Michigan! My mom on the left working our way from oldest to youngest! 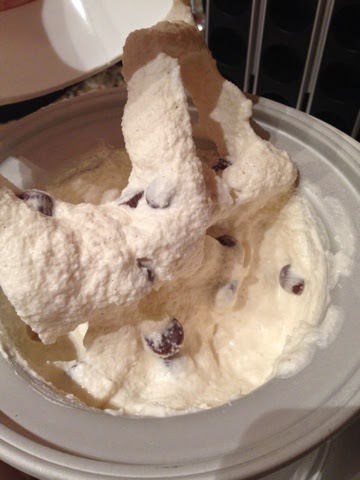 As promised, I challenged myself to make the more "complex" version of ice cream from my previous post. After doing a little research I found that this more complex method is called French-style ice cream, that is, using egg yolks to create a richer, thicker, and creamier ice cream. 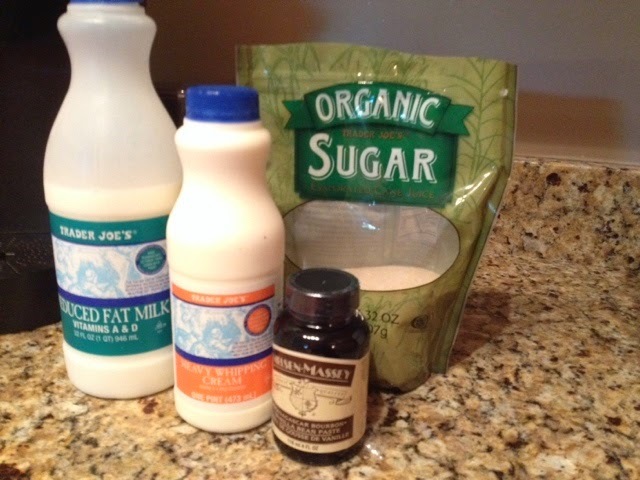 The version I made last week is referred to as Philadelphia-style, using just milk, heavy cream, and sugar. All in all, I must admit that for the amount of effort involved, the difference was a lot less than I was expecting. It was delicious, but so was the other one, and it required very little effort. Maybe it's just me, so definitely give this a go. Besides, it's fun to try new things and learn something new in the kitchen! 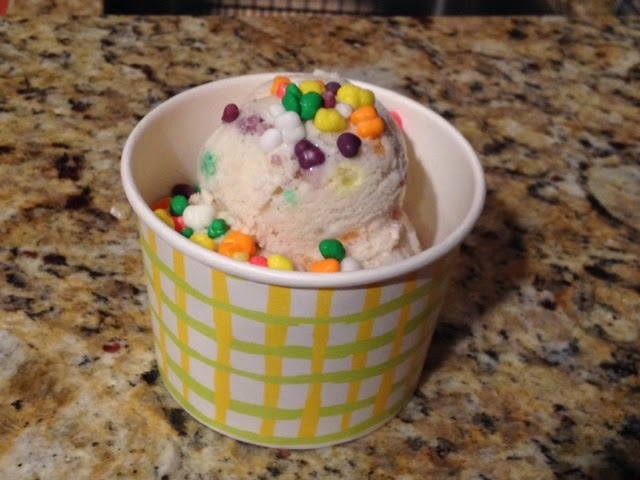 This particular batch of ice cream was made especially for my boyfriend, who this past week turned the big 30! He is not a dessert guy, which makes us great opposites, but what he does love is nerds, sweetarts, and nerds blizzards. This rendition turned into my attempt at a version of a nerds blizzard... The only problem is that it was consumed so quickly that I didn't get a photo of the final product! Guess I'll just have to make it again...gee, isn't that a shame when that happens! 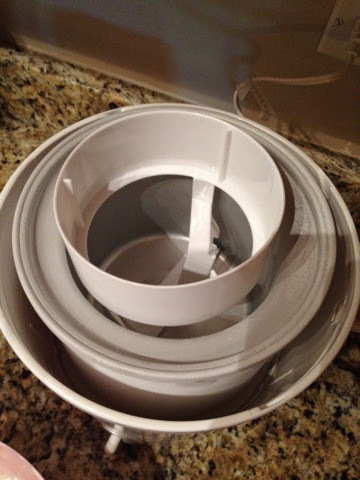 The following will outline the additional steps required to make French-style ice cream. 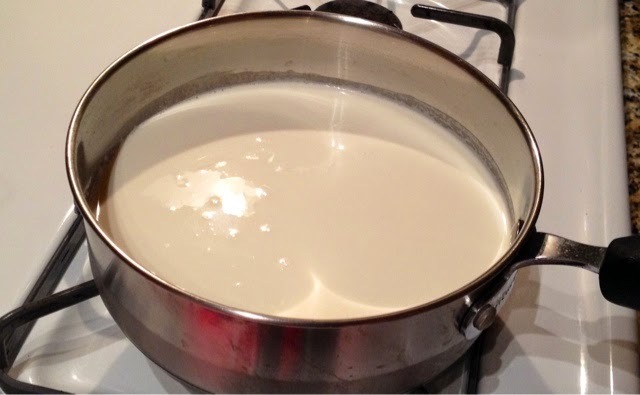 First, combine 1 3/4 cup of milk with 1 cup of heavy cream in a medium pot. Bring it to medium high heat just until it simmers. Reserve 1 cup of heavy cream, we'll use that in a bit. You'll need 4 egg yolks and instead of throwing away the egg whites, I like to hang on to those for a healthy breakfast scramble... Or until I find that Tupperware in the back of the fridge a week later and try hard to recall what that stuff is. Eesh, did I just admit that? 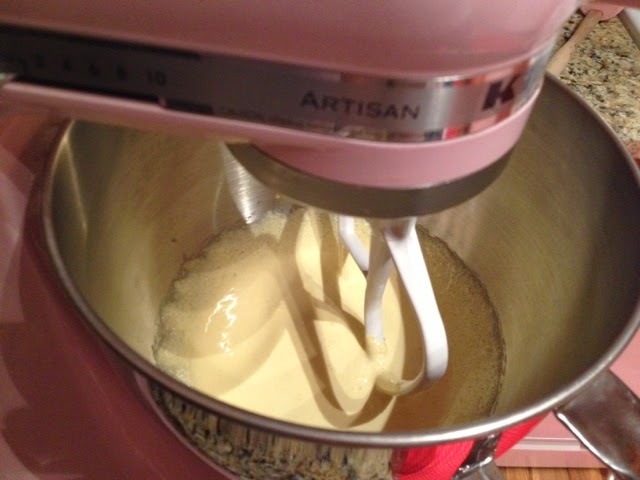 In a mixer (I love any excuse to bust this baby out) combine the 4 egg yolks and 3/4 cup of sugar on medium speed until the texture is thick and resembles mayo. 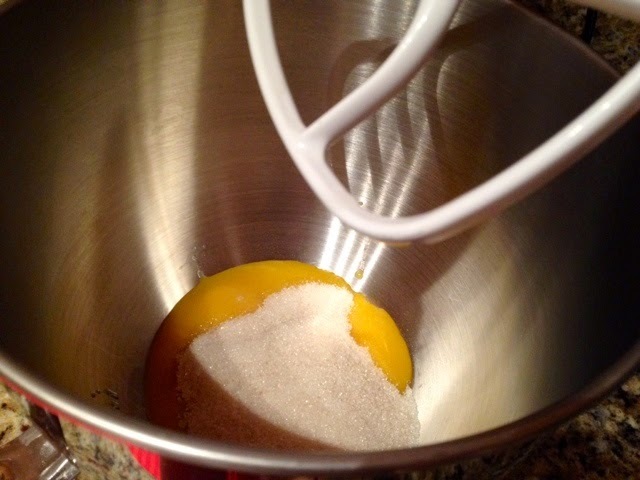 A quick note, use regular granulated sugar. I used granulated cane sugar and it took a long time to dissolve the sugar into the eggs. I'm not a baker and won't pretend I am, so there may be a logical reason for this, I'm just sharing my experience. This could take anywhere from 2-8 minutes as mine took awhile! It's thick but not stiff. Now, here's the tricky part! 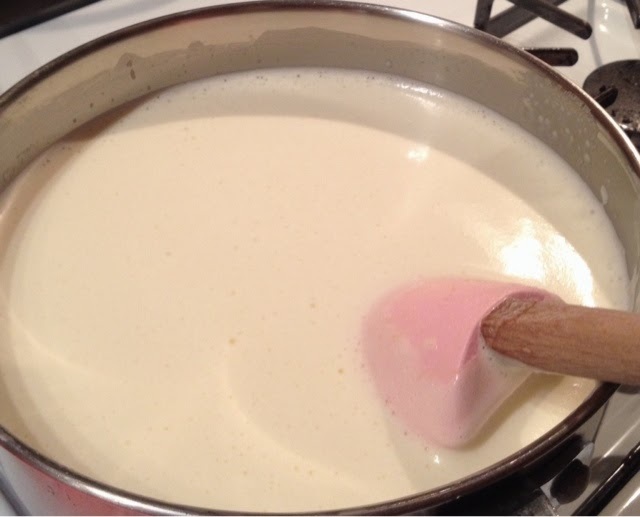 Take a cup of your simmered milk and cream mixture and while the mixer is on medium slowly drizzle in the hot milk into the egg and sugar. Be careful to not curdle the custard...an ice cream with bits of scrambled egg does not sound appealing! 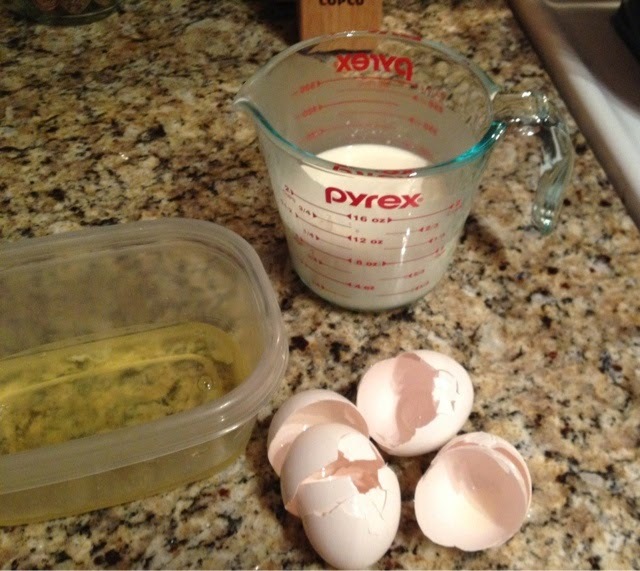 Now, transfer the tempered eggs into the pot with the remaining milk and cream. 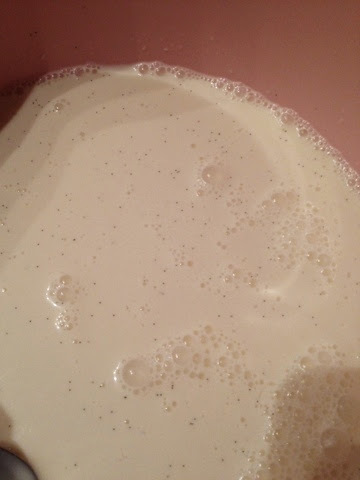 Over medium low heat stirring constantly, combine this together until the mixture thickens. You should be able to draw a line on the back of the spoon and it should stay put. That term is a fancy French word called 'Nappe' (nah-pay). Feel free to use these terms in front of people to sound super sophisticated! 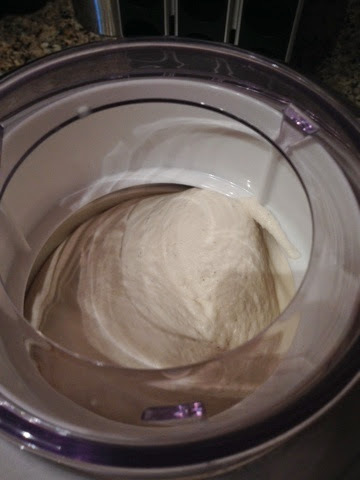 Once this mixture is thick I added the additional cup of heavy cream and my favorite vanilla bean paste, as I noted in my previous ice cream post. 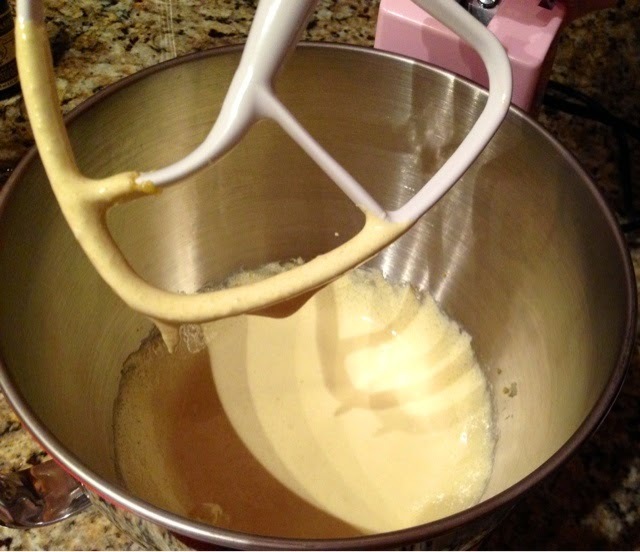 You can use vanilla extract or simmer a scraped vanilla bean instead. 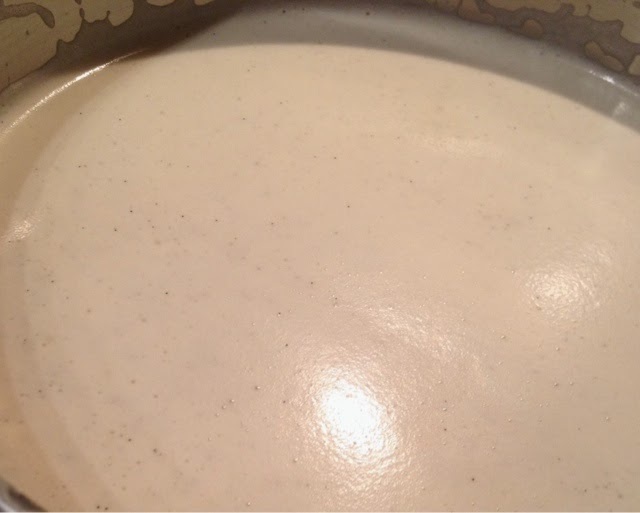 I would suggest pouring this creamy base through a fine sieve to remove any imperfections that may have been caused from the eggs. I don't have one so I was pretty darn careful and took a big leap of faith that it was okay! (It was fine). 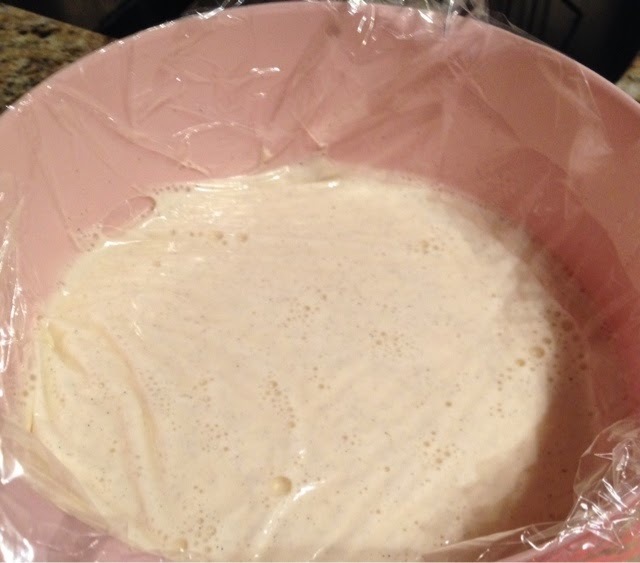 Then pour this into a large mixing bowl and cover directly with plastic wrap to keep it from forming a weird skin. Place in the refrigerator and chill for a few hours or best if left overnight. In such a hurry preparing for my boyfriends surprise birthday party I didn't take any more pictures... Epic fail! But the process is the same at this point. 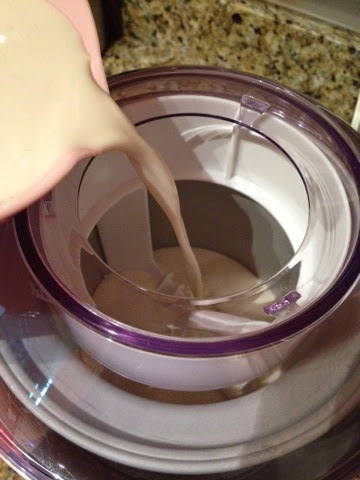 Run through your ice cream maker for 20-25 minutes and add in your topping (if adding one) in the last couple minutes to combine. I added nerds, about a box and a half and it turned out pretty sour from the candy! The guests and the Birthday Boy seemed to enjoy it because it was gone before I knew it! Hope you give both of these recipes a try, I would love to hear your feedback from both versions! I am notorious for taking a great recipe and putting my own spin on it. Mostly because I don't follow the directions very well and also I improvise based on my taste preference or what I have in my fridge. 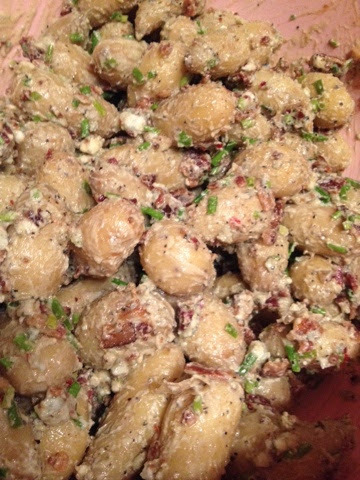 My sister Cate makes a great potato salad that is one of my favorites because instead of mayo she uses olive oil, blue cheese, and vinegar. It's so good! Well, when I asked her for the recipe I thought it was missing a few things. 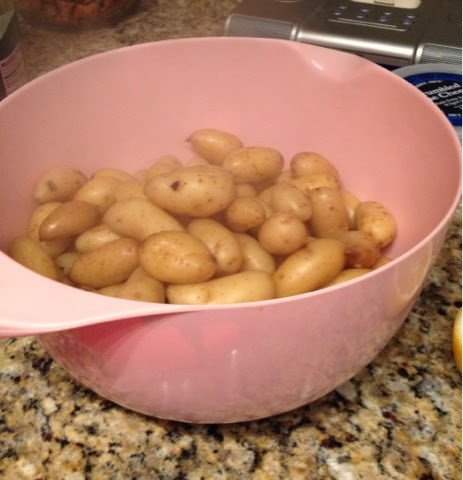 Instead of red potatoes I used Trader Joe's teeny tinys... The perfect one biters! Then I swapped out the vinegar for lemon juice, added chives, garlic, and crumbled bacon... Oh my goodness! This is a perfect summer side dish to bring to a BBQ but be sure everyone around you is eating it because the garlic definitely lingers. 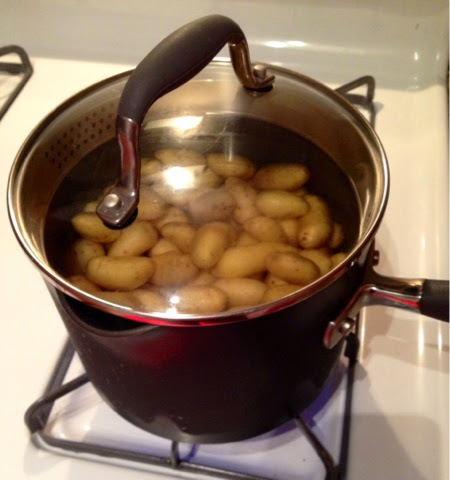 Start by putting the potatoes, I used 2.5 pounds in a large pot and cover with cold water. 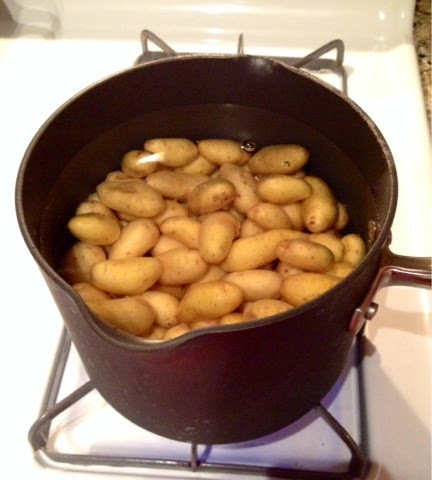 While the potatoes are cooking gather the rest of the ingredients. 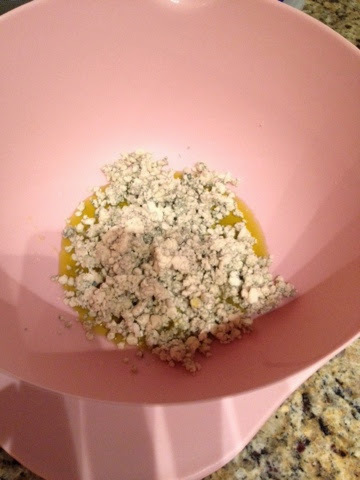 In a large mixing bowl combine the following: 2 Tbl olive oil, 1/2 cup of blue cheese crumbles, 2 Tbl of lemon juice (about half a lemon), 1 garlic clove minced, salt, pepper, and a few shakes of red pepper flakes. 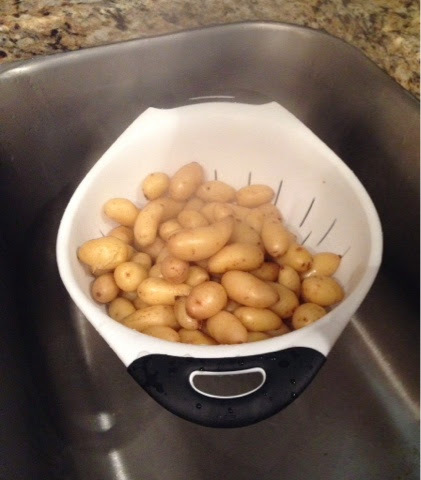 Drain the potatoes and give it a good shake to remove any excess moisture. Pour the hot potatoes into the blue cheese mixture and toss to combine. The blue cheese melts and creates this luxurious "sauce" if you will. I know it looks pretty unappealing but let me tell you, the aromas going on right now are heavenly! Place the bowl in the refrigerator and let it set up for at least an hour, the longer the better, if you have the time. When you take it out of the fridge add in 1/2 cup chopped bacon, 2 Tbl minced chives, and an additional 1/4 cup or so of blue cheese. Check for seasoning and serve! I like to take the salad out about 15 minutes prior to serving to take the chill off. 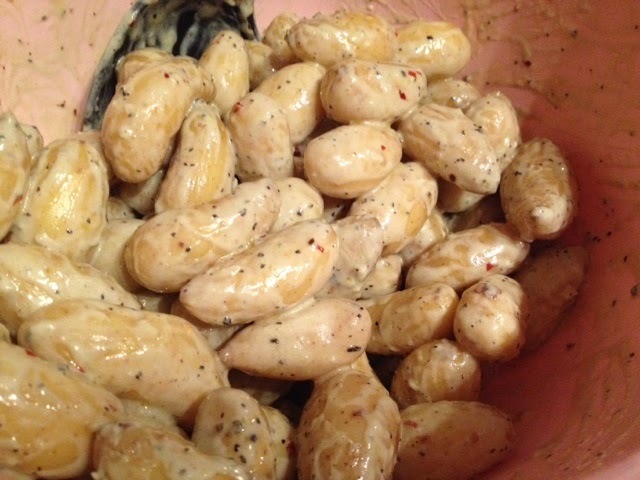 This is super flavorful and rich and arguably better than a gloppy mayo based potato salad! I remember getting a list of recommended cooking tools from my chef instructor for class. As a broke college student I took my list and headed to Sur la table, praying I could make it out of there without spending more than $20. After collecting everything I needed I made my way to the register and something caught my eye. 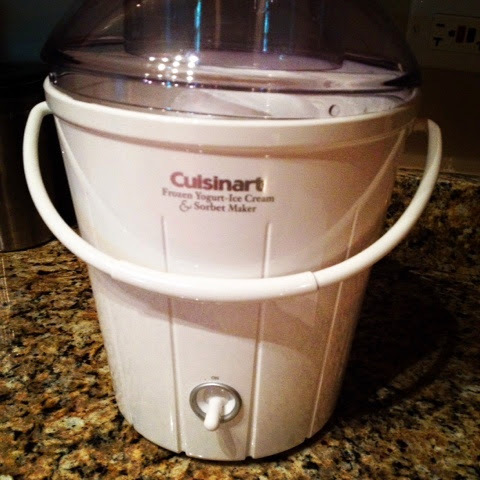 An ice cream maker... That would be pretty cool to have! After a few deep pondering minutes I decided to drop my armful of important things like a fish spatula and zester and instead buy this adorable ice cream maker. Does this paint a nice picture of what a strange 19 year old I was? I think so! Needless to say, I am thrilled with my decision and always look forward to summers in Chicago when I can make my own ice cream! 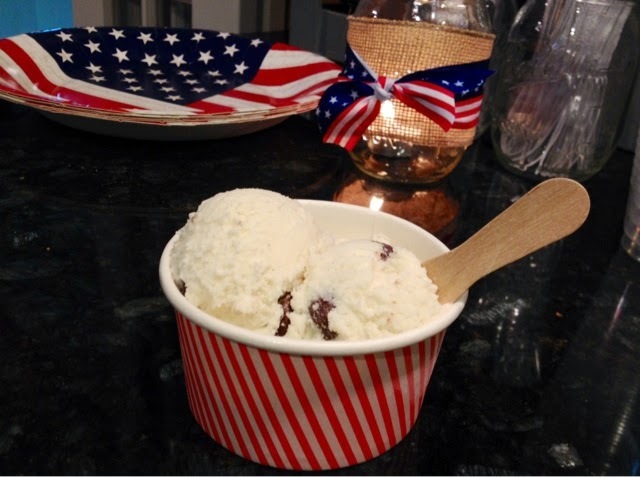 Of course this can be used year-round but there's something nostalgic about ice cream in the summer. 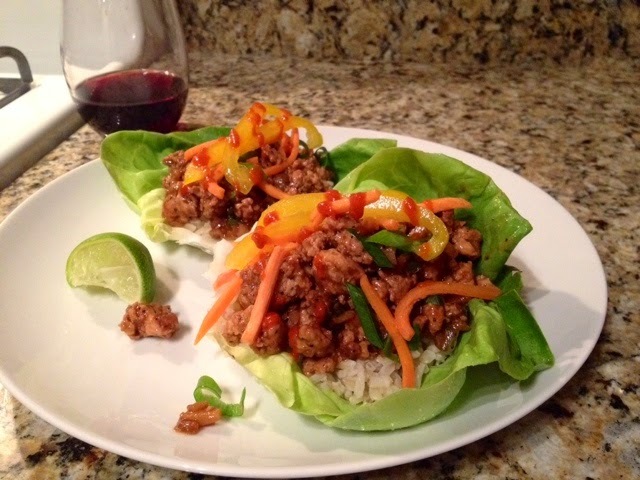 I use this super simple recipe that tastes delicious and couldn't be easier. I have plans to make a more "complex" version this weekend and we'll see how it compares. So stay tuned! These 4 ingredients are all you need to make vanilla ice cream...oh and normally I add in a plus 1. 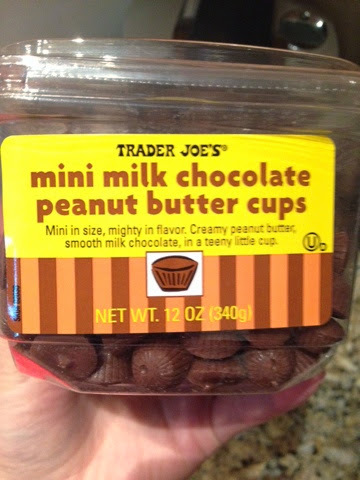 This plus 1 could be crushed up cookies, brownies, candy, chocolate chips, nuts, etc. we'll get into that later. 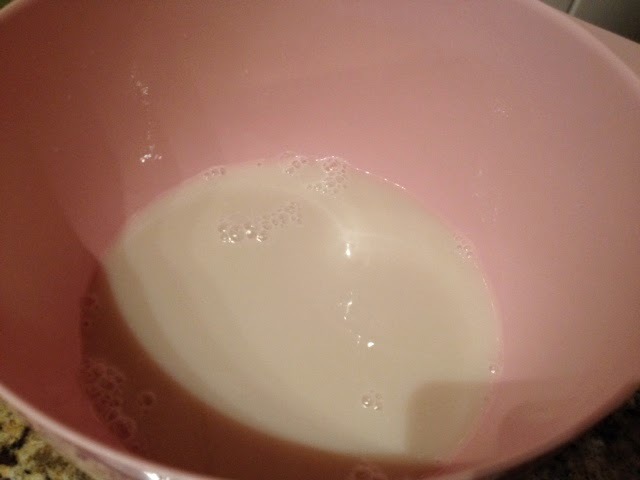 Mix 1 cup of milk with 3/4 cup of sugar and whisk until the sugar dissolves, about 2-4 minutes. 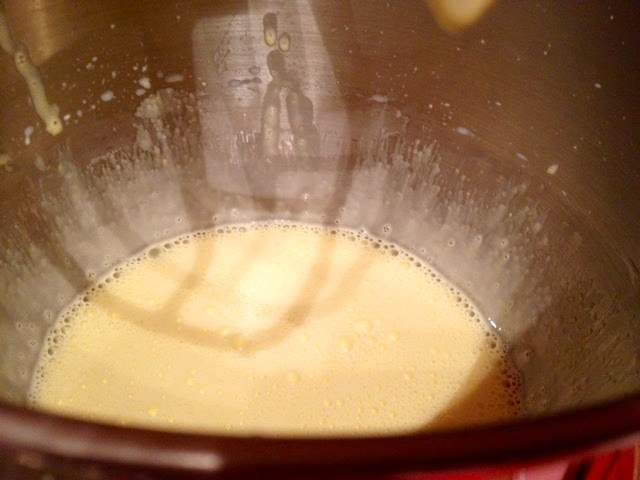 Now add in 2 cups of heavy cream and 1 1/2 tsp of vanilla. Use good vanilla, it makes a huge difference! 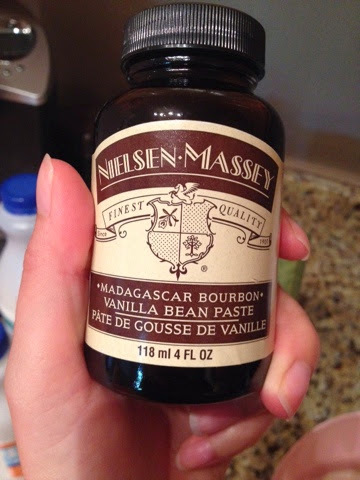 I like this Nielsen Massey vanilla bean paste because it's thick and sweet and loaded with vanilla bean flecks. This is the real deal!! 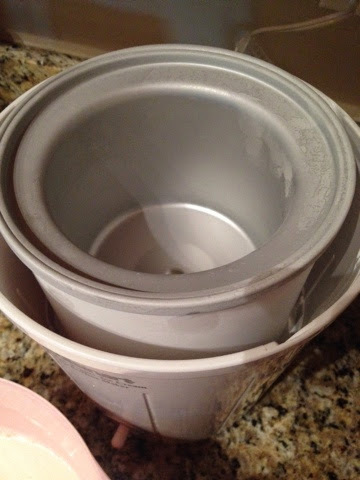 Take the frozen insert out of the freezer at the very last second and get the machine ready to go! 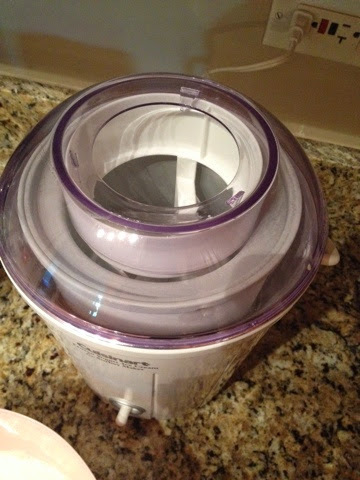 Flip the switch to ON And pour your ice cream base into the machine. It should take about 20-25 minutes total. During the last couple minutes slowly add in your plus 1 (or 2) and let the machine mix it together. I used these lovely morsels in mine... So delicious! And there you have it! 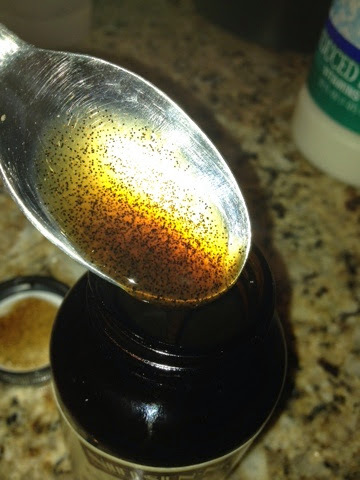 Transfer with a rubber spoonula or wooden spoon into a freezable container and let it set up for about an hour if you have the time. The texture is lighter than ice cream bases made with egg yolks and I'll make a different version to compare this weekend. This is a super simple and tasty recipe with lots of room for making it your own! When I was in culinary school, I learned something extremely practical for cooking that will help (haunt) me forever. This learning experience is called "mis en place" or in French means "everything in it's place". Before you even turn on the stove you are supposed to get everything ready for what you are about to cook. How many times have you started a recipe and halfway through realized..."Oh shoot...I don't have that.." In hopes your neighbor has that ingredient you are basically stuck. I have, many times! If you pre-plan or gather your ingredients before you cook you have time to quickly run out or have that special someone in your life run out for you. This is especially helpful for certain types of meals like stir-fry or baking when these ingredients need to be handy for it to turn it. It's a timing game. Tonight I made a recipe I make often, especially on nights I want a lighter dinner that I feel great about eating, turkey lettuce wraps! Like I said, I've made this dish hundreds of times and each time tweak it a bit based on what I have on hand and who I'm feeding. For instance, I like adding chopped mushrooms to mine but my boyfriend would never eat it if he knew they were in there! Also, I like it spicy but if I were feeding this to my mom I would have to scale way back on the heat! If you aren't sure what spice level you can handle I would be modest and serve Sriracha on the side... You can always add more but you can't take it out! 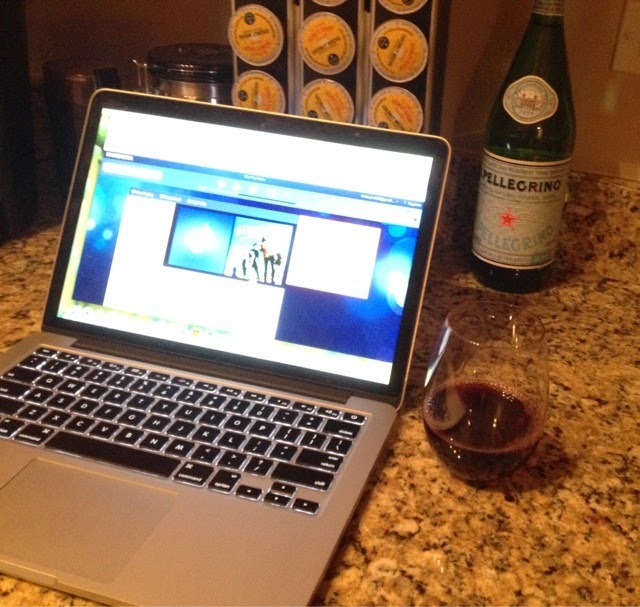 First things first, get your music station ready and pour yourself a beverage. This is a pretty crucial step. 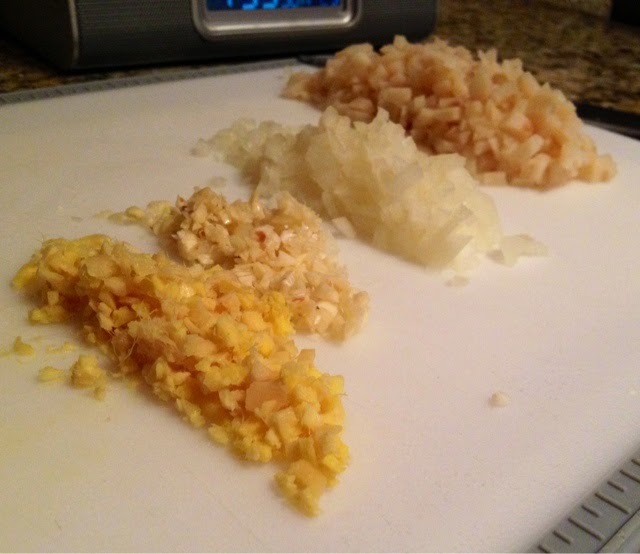 Now chop up fresh ginger, garlic, yellow onion, and a can of water chestnuts. 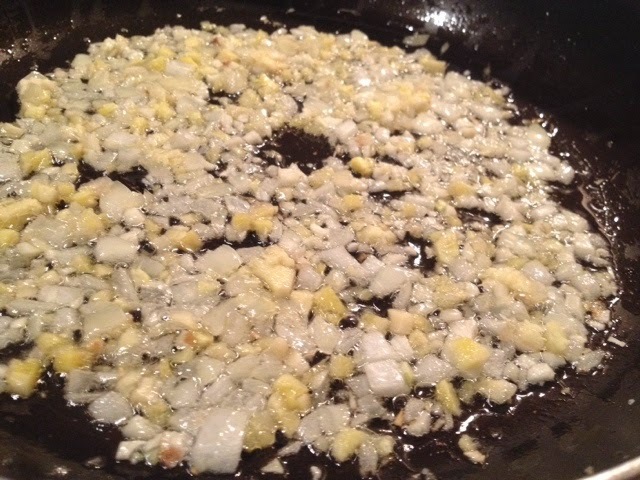 There was probably a cup of diced water chestnuts, 1/4 cup of onion, 2 Tbl of garlic and 1/4 cup of fresh ginger. I had a diced jalapeño left over, this is optional for extra heat. You'd want to chop that up at this time. In a hot pan drizzle in a little olive oil and reduce heat to medium. Add in the onion and garlic and sauté until translucent. Next, add in the water chestnuts, ginger, and jalapeños. Season with salt and pepper and sauté for a few minutes until the jalapeño is tender. 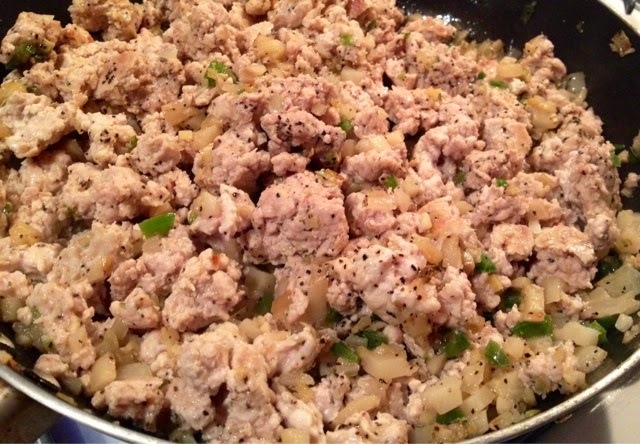 Add 1 1/2 pounds of ground turkey breast and break it up with the back of a spoon. Cook over medium high heat until the turkey is almost cooked through, about 8 minutes stiring every couple minutes. Season with salt and pepper. Now it's time for the transformation! I added 1 Tbl low sodium soy sauce, 2 heaping Tbl of Hoisin, 1/4 cup of peanut sauce, 1 tsp of sesame oil, and 1 Tbl of Sriracha. Stir to combine and continue cooking for a few minutes. 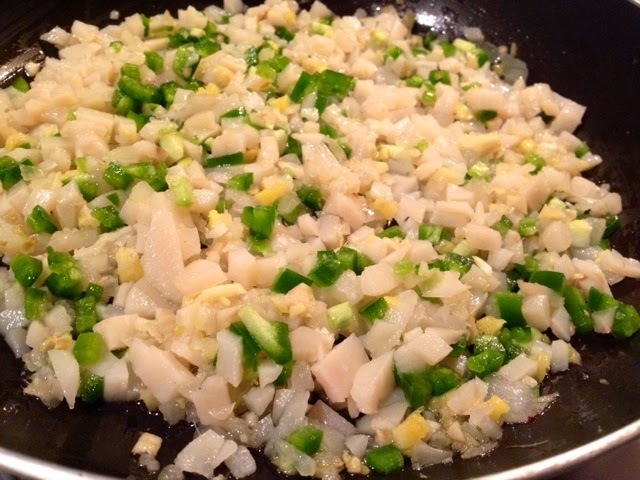 Stir in chopped green onions and taste/adjust seasoning. 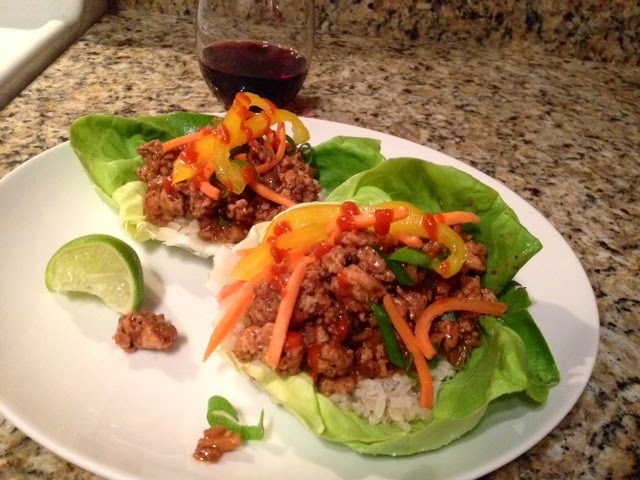 I used Boston lettuce but use whatever you can find at the store. 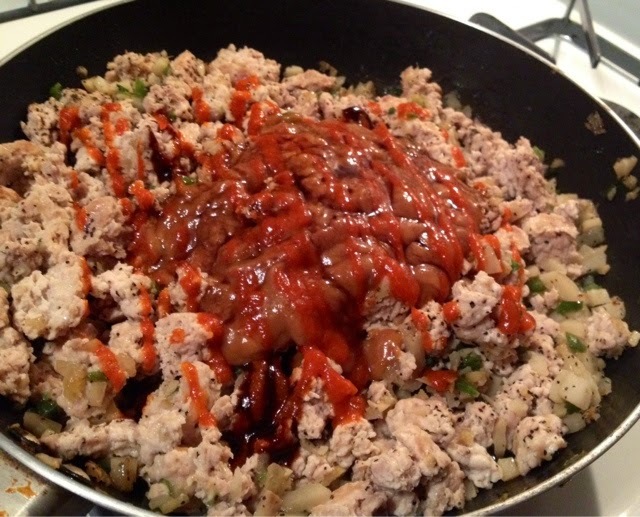 I also serve the turkey mixture over a bed of warm brown rice and garnish with thinly sliced bell peppers, carrots, green onions or cilantro, and an extra drizzle of Sriracha. I always finish it with some fresh lime juice to cut the heat.